Hi! I’m not Audrey Vernick, I’m Erin Murphy, Audrey’s literary agent. When Audrey started this blog focused on literary friendships, I knew she had to somehow include her own friendship with Gbemi (Olugbemisola Rhuday-Perkovich). I was there the day they met, so I picked up the microphone and pointed it at them. EM: The day the three of us met is forever burned into my memory, and I mean that in a very good way. Who could have predicted that I would connect so strongly with each of you, and each of you with each other, at a one-day writers conference? But that’s not really my question. What I’m really wondering is, since you each had to read each other’s work in order to participate in the critique circles at that conference, and that happened via email before you ever met, would you say you fell into friendship with each other’s characters before you did with each other? AV: Well, this story won’t make me look good. In the weeks before the conference, participants had to send each other their stories for review. I had received almost everyone’s but had no record of receiving one from someone in my group named Olugbemisola Amusashonubi Perkovich. So I sent an email to this person asking him/her to send it to me at his/her earliest convenience. It’s possible that the letter came off as a bit of yelling. But I didn’t mean it. ORP: A bit?!!! There were a lot of caps. Scary caps. And I, having just come out of a critique group that made me feel rather like an alien, was fragile. I was more than a little anxious about this particular conference; I’d been on the conference circuit for a long time, and had perfected my technique of looking-engaged-but-not-talking-to-anyone. I knew that this conference involved not only the inevitable talkiness of a small group, but the long-awaited opportunity to meet the elusive Erin Murphy, whom I’d waited a year to meet. Also, I *knew* that I’d sent it. BECAUSE I DID. AV: Sometimes things that are sent really don’t arrive. But I will take this opportunity to publicly admit, for the first time, that months later, in my mess of an email filing system, I found that this person, Olugbemisola Amusashonubi Perkovich had already sent her chapter, and I just lost it. ORP: Do you, Audrey? Because I don’t know if you do. Because before I’d gotten that undisputably yelly email, I’d fallen in love with a certain Vernick creation. I was thinking that maybe, just maybe, I was going to find a friend at one of these nerve-wracking things, a friend who wrote gloriously — with humor and heart. AV: Okay, this was just a bad place to start. Because once we got past that awkwardness, and I have witnesses to support this, I publicly proclaimed my undiluted voice envy after reading your work. That Reggie, that voice, was right THERE once we got past the email confusion. Oh, Reggie! I was and remain in love. ORP: Seriously, despite my trepidation, I had hope. Against all odds, and all caps, I had hope. Because there was that story. Because you had written about baseball, a sport that I liked, you know, but it wasn’t like it was basketball, or figure skating, or even pro-wrestling of the 80s, but, yeah, it was OK (not beach volleyball or women’s tennis) — until I read your love of it right there on those pages, until I met a boy named Casey who loved his friends and his family and his life at umpire school … and I wanted to be his friend more than anything. EM: There’s a very good message here about not letting first impressions stick, or something. Also, it’s clear how good you two are at making fun of each other, erm, I mean, yourselves. Which segues nicely into the next item of business. Together, you’ll be doing a workshop about writing humor at an upcoming SCBWI conference. Would you each share your favorite funny moment that the other has written? AV: A terrible fact about me, which annoys every child on every school visit, is that I can never pick a favorite (except for ice cream flavor: Ben & Jerry’s Coffee Coffee Buzz Buzz Buzz). I could not possibly pick a favorite funny moment. I love the sum total of funny, including, but not limited to: the way no one can get away with saying anything near Ruthie–“Yuck, ‘rule the school.’ That’s so…Western, so imperialistic;” Reggie’s passing thought that “maybe if John the Baptist wasn’t all crazy-looking and bug eating,” people might not have paid attention to him; the trivia on Juiced! bottle caps; confusing the word parabola with the word parable; the horrible (but hilarious) things Reggie and his sister Monica say to each other; and Joe C. saying about Ruthie, “She runs like a girl,” which is SO something you simply CANNOT say about Ruthie. I could go on and on but my point is that it’s the sum total of the book that is my favorite. Okay? People may call you silly. But you must be used to that. Did anyone say, “Hey, that’s a really great idea!” when you brought a baby buffalo home? I think Audrey’s funny works because even when there’s sarcasm, it’s never mean. She can’t hide her warmth (though Lord knows she tries), and her love for what she is doing (and seems to do so effortlessly) is evident. EDGAR’S SECOND WORD and BOGART AND VINNIE are trademark Audrey — laugh out loud funny, breathtakingly sweet without ever being cloying, and razor-sharp language — not an extra word or syllable anywhere. I don’t know, she just makes you want to hug her books. AV: I want to add that while the funny is definitely part of it, what I love most about Gbemi’s writing is that it is HER. I cannot separate author/person/friend from the book. 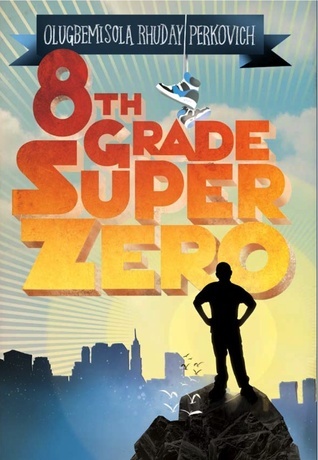 8TH-GRADE SUPERZERO is everything Gbemi is: large-hearted, socially responsible, funny, warm, real, and inspiring. EM: Gbemi, that’s interesting that you said that about wanting to hug Audrey’s books–I know I have described 8TH-GRADE SUPERZERO exactly that way. I love that with each of you, your work reflects yourselves in such wonderful ways. You both bring a whole amazing package to the table! AV: I will bring mojitos because they are the one thing I make extraordinarily well and they are an apt way to toast new releases and the start of summer. I shall also bring some cud. ORP: I will bring a surprisingly sweet kale and mango salad, some no-surprise-there homemade candy sweetness, and walking shoes for us all so that we can have a walking adventure together in our celebration city (which as you both know, is NYC, of course), and find all of the lovely and amazing little stories that ordinary people live every day. Thank you so much for hosting, Erin. I lift a mojito in your honor. And Gbemi, thank you for not yet killing me about the lost email disclosure. Happy paperback release day to you! To learn more about Erin Murphy and the Erin Murphy Literary agency, visit the agency website. To learn more about Gbemi and her writing, visit her website. This entry was posted in Uncategorized and tagged 8th-Grade Superzero, Audrey Vernick, Ben & Jerry's, Bogart and Vinnie, Coffee Coffee Buzz Buzz Buzz, Edgar's Second Word, Eighth-Grade Superzero, EMLA, Erin Murphy, Erin Murphy Literary Agency, Is Your Buffalo Ready for Kindergarten, lost email, mjojitos, Olugbemisola, Olugbemisola Amusashonubi Perkovich, Olugbemisola Rhuday-Perkovich, paperback release, SCBWI, Teach Your Buffalo To Play Drums. Bookmark the permalink. I suppose it helps that I deeply love all three players in this post (and the books! ), but this struck me as fresh air (maybe it’s the mojitos photo). This post is a great way to breeze into the unofficial start of summer. We should call this post “Summer of Love”! Can’t wait to meet you both (sans Erin) this weekend! 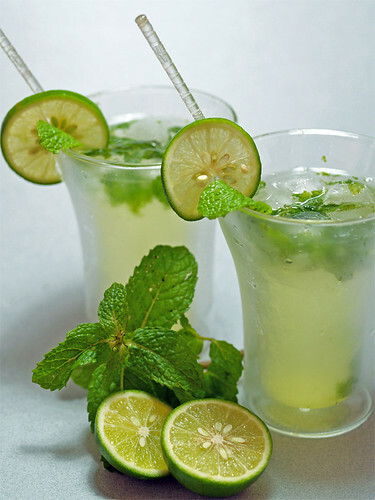 Congratulations to both of you:) Now I really want to try a mojito. Gosh! I’m so jealous of this brilliant, warm and funny friendship. Sounds like Miss AV is a little like me in a “where’s the manuscript” sort of way. I’m delighted to know both of these ladies remotely and I adore their books. Congratulations on the new releases!!! Love this interview! SO envious of your friendship, literary and otherwise, and I can’t wait to read Obemi’s book which I’m ordering right away. And to meet her. Love this blog, too. Bracing and intoxicating like a…can you guess? Slurp! Curtains up on the best comedy duo since Elinor and FDR. Not “Elinor.” Make that Eleanor. The praise remains the same.